DeZURIK Eccentric Plug Valves feature a rectangular port design that provides wide tolerance seating geometry for lasting superior shutoff. The eccentric plug action and resilient plug facings assure lasting dead-tight shutoff. Standard features include corrosion-resistant bearings, welded nickel seat, grit excluders, and adjustable stem seal packing. Port area options include 100% of standard pipe area for applications where highest flow is required (such as pumped systems), and 70/80% area for non-pumped (gravity feed) systems. The straight-through body design maximizes flow capacity and reduces head loss. 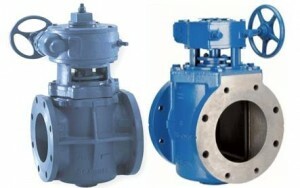 Flanged or mechanical joint end connections are available. Eccentric Plug Valves are capable of handling clean and dirty liquids and gases, sludge and slurries. D10063 - IM ACT G-SERIES MANUAL ECCENTRIC 4-36"
D10095 - IM VALVE PEC .5-3"
D10032 - IM VALVE PEC 20.5-36"
D10019 - IM VALVE PEC 36.5-72"
D10021 - IM VALVE PEC 4-20"
D10453 - IM VALVE PEF 100% PORT 3-36"